Rev. Dr. William Smith Jr.
Rev. Dr. William Smith Jr. Presiding Elder , 73, departed this life on Tuesday August 28, 2018 in Atlanta Ga. He was the father of Rebecca Hall and Jemal Alston. Reverend Dr. William Smith Jr., Presiding Elder, was born on January 11, 1945 in Philadelphia, Pennsylvania. The son of the late William and Australia Smith, he was raised by his grandparents, Paul and Annie Williams in Marion, South Carolina. He departed this life on August 28th in Atlanta Georgia. Dr. Smith was a 1963 graduate of Terrell’s Bay High School, Centenary SC. He continued his postsecondary education receiving a Bachelor of Arts Degree from Allen University, Master of Divinity Degree from Turner Theological Seminary, Master of Theology Degree from Princeton Theological Seminary, Doctorate of Theology Degree from Jamison Theological Institute, Doctor of Ministry Degree at Wesley Theological Seminary, Honorary Doctor of Divinity Degree from Monrovia College, Monrovia, Liberia (West Africa); and completed the residential requirements for his third Doctorate from Drew University. Dr. Smith’s pastorate began at the age of fifteen (15). He was ordained an Itinerant Elder by the late Bishop Carey A. Bibbs in 1963. He has served as a pastor in the AME Church for forty-five (45) years and as a Presiding Elder for the past fourteen years. He has been elected a delegate to eleven General Conferences: 1976, 1980, 1984, 1988, 1992, 1996, 2000, 2004, 2008, 2012 and 2016. Dr. Smith was the Presiding Elder of the Florence-Dillon District. He was the former Presiding Elder of the Marion District, and the Columbia District of the AME Church. He served as a Supervisor for Supervised Ministry of Payne Theological Seminary. Dr. Smith was the Vice-President of the Seventh Episcopal District Board of Christian Education and a member of the Seventh Episcopal District Budget Committee. He was an adjunct professor of Allen University of Columbia, SC and former Interns Supervisor of Erskine Theological Seminary of Due West, SC. 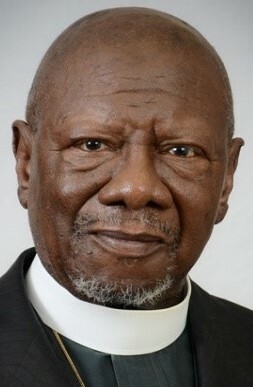 Dr. Smith also served on the Connectional Council, Connectional Presiding Elders’ Council (Treasurer), Connectional Church as a member of the Strategic Planning Committee and Re-Districting Committee; Seventh Episcopal District Presiding Elders’ Council, member of the General Board, and a member of the Allen University Board of Trustees (Secretary). Always civically engaged, Dr. Smith was a former Commissioner of Human Affairs, State the of South Carolina; and a former Housing Authority Board Member in Myrtle Beach, SC. Dr. Smith was a member of the NAACP, Southern Christian Leadership Conference, National Committee of Black Church Persons, Kappa Alpha Psi Fraternity, Inc, and a member of several religious, civic, governmental, community, and fraternal organizations and committees. Presiding Elder William Smith, Jr. is preceded in death by his loving wife, Angela Hawthorne Smith; Parents William and Australia Smith; Sisters Lorraine Smith, Deloris Smith; and Brothers Elder Rufus Smith and Cleo Smith. He is survived by his son, Dr. Jemal Erinon (Lakashia) Alston; his daughter, Rebecca (Kenneth) Hall; eight grandchildren: Janeil, Jakeysa, Jakayla, Kenneth, Madison, Mia, Ava, and Nadia; sisters, Candiesas Smith-Harris and Earline Cole; brother, Michael Cole; mother –in-law Theresa Hawthorne; sister-in-law Karen (Linzy) Washington; brother-in-law Clarke (Charlotte) Hawthorne; God mother Willie Townsend; sisters by choice S. Yvette Vant and Eunice Clarke; and special cousin with whom he was raised, Martha Yancey. He also leaves to cherish his memory a special friend Audrey F. Nock, an amazing and dedicated Administrative Assistant, Pamela D. Williams, a special niece Leslie (Michael) Fredrick, a special nephew Darryl (Kafi) Shufford, and a host of loving nieces, nephews, and other family members and friend.